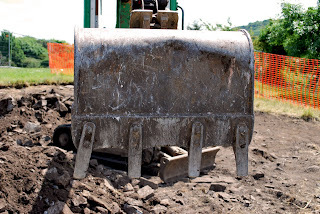 The report on the environmental samples taken from the soil filling the possible medieval ditch around Oystermouth Castle has just been returned to the office. I’m beginning to wonder if the ditch (assuming it existed) ran around the bottom of The Tump, which was used as an outer bailey. With the few survivors left to tackle what was left behind from Friday, we finished off backfilling and took down the fences. Trench 1 now looks like its former self and with the fences taken down it looks like no one was ever there…well apart from the fresh soil! The weather, being glorious for the past three weeks decided to see the group off by showering us in rain and giving a rather vocal display of thunder. This will be the last you will hear from us students this year…until next time (fingers crossed). 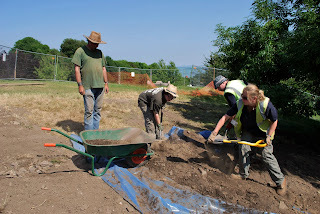 Continuing our efforts from Thursday we again took on the task of backfilling Trench 1, given the hot weather it was stupidly hard work but everyone managed to struggle through to the end. Sven arrived slightly later than everyone else having picked up a gigantic van (big enough to carry at least one elephant!). When the tools were loaded into the back of the giant van and taken back to the office the end of the dig was almost in sight. Unfortunately we did not have the time to take down the fencing, which will have to be finished off on Monday, due to lack of manpower. Now though we are off to the pub for some hard-earned pints! 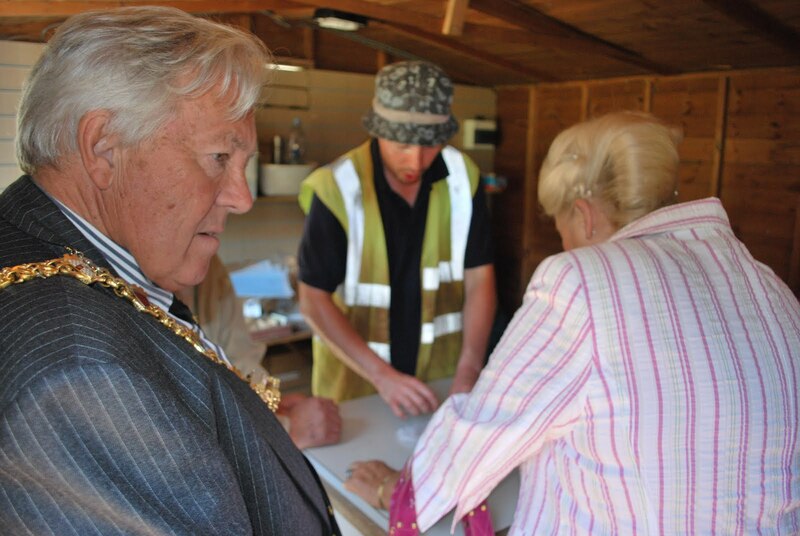 The Lord Mayor of Swansea, Cllr Richard Lewis, and the Lady Mayoress visited the dig in the afternoon. I was there to greet them, along with Gerald Gregory, one of our Trustees, and members Pamela Lewis and Luke Toft. They also talked to various members of the team. 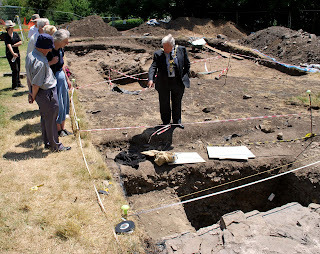 I showed took them round the site, and Rob and Andy explained what had been found in the various trenches. Andy also showed them some of the nicest finds, from last year as well as this year. 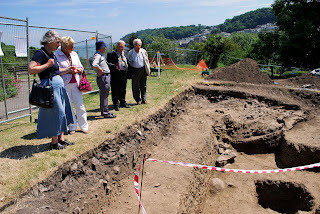 Mrs Lewis was particularly interested to see what we had discovered, since she was brought up in Oystermouth and used to play at the castle when she was a girl. Day 17 - I aint gettin’ in no trench fool!! With the weather slowly changing across the day from looming clouds to glorious sunshine the efforts of backfilling Trench 1 are well under way. 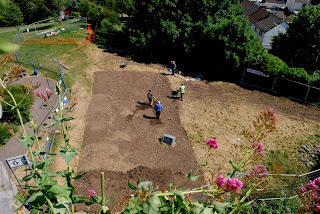 This morning the remains of the trench that we had all worked hard on were still visible, and by this afternoon the resulting trench looks more like its former self three weeks previously. All day we have been digging along side the mini-excavator, which happened to break down half way through the day, and to be honest we are all shattered. I don’t think any of us will have trouble getting to sleep tonight. 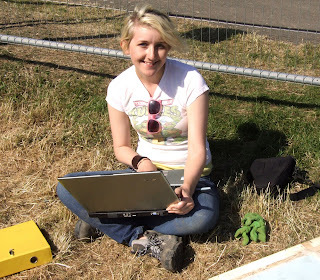 The weather wasn’t quite as hot today and there was a light breeze, which made it easier to work. No extra excavation was carried out today in Trench one, as the maximum depth had been reached in both sondages. Today mostly consisted of the recording of Trench one by taking photographs and drawing the sections in the sondage with the elevation of the foundation wall for the suspected drum tower. We also began digging a sondage in Trench five in order to see whether there were any features further down, however, we reached the natural subsoil at quite a shallow depth here, suggesting that this area was a quarry rather than an early bailey. We also had a special visitor – Richard Lewis, the Lord Mayor of Swansea! Yes, the Mayor came to enquire about our work here at the castle on behalf of the community and enjoyed taking a look around to see what we had found and accomplished. Another glorious day with the warm sun on our backs and a cool breeze in the air here at Oystermouth Castle. 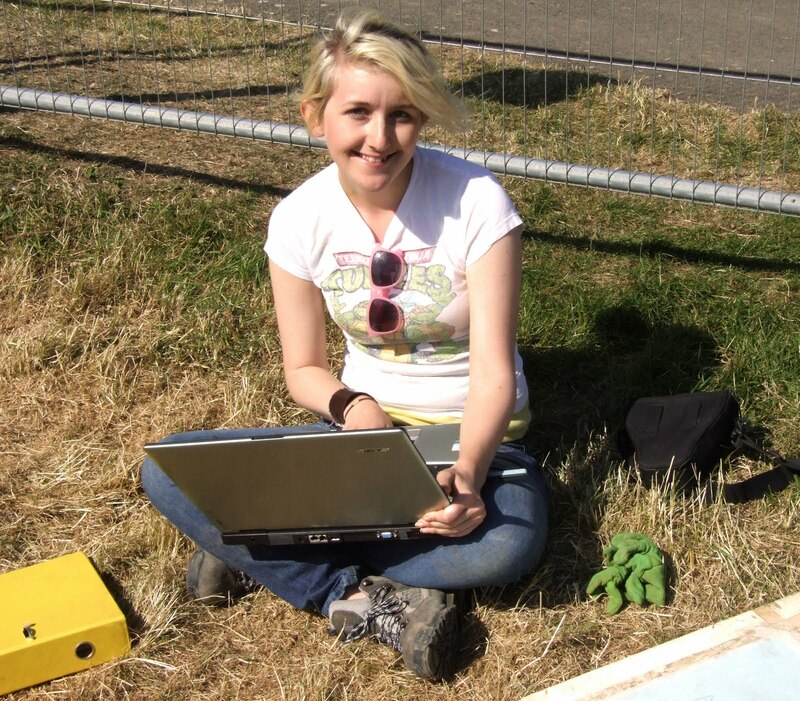 We have been busy continuing the excavations in Trench 1 with varied results. At the south end of the trench we have extended the sondage through a sandy layer to a depth of about 2 metres. Towards the north end the base of the drum tower has been excavated further to 2 metres as well to reveal that the structure runs deeper than we first thought. Trenches 4+5 have revealed little since the first week, we finished off recording those trenches today, and the majority of our ‘task force’ have been allocated to Trench 1. The Glamorgan-Gwent Archaeological Trust, in association with Cadw, the Friends of Oystermouth Castle, Swansea City Council and Swansea University, will be carrying out a dig in the grounds of Oystermouth Castle between 7th and 25th June this year (including Saturdays and Sundays), and there will be the opportunity for you to join in. We will be excavating outside the west tower, looking for the outer wall and the ditch, and on the Knoll, to see what’s there (a geophysical survey commissioned by the Friends suggests that there are walls).